Bettors will have plenty of odds and point-spread options on Wednesday with three college football bowl games, but one game in particular is catching the attention of both Pros and Joes bettors. Three college football bowl games will span more than 12 hours on Wednesday, starting with the First Responder Dallas Bowl and ending with the Cheez-it Phoenix Bowl in Arizona. Bettors will have plenty of odds and point-spread options throughout the day, but one game in particular is catching the attention of both Pros and Joes bettors. Georgia Tech is seeing strong support in the Quick Lane Bowl vs. Minnesota in head coach Paul Johnson's final game. Sharp bettors at the Westgate LV SuperBook took the Yellow Jackets at -4, while nearly 70 percent of the betting public has also backed GT up to the current number of 5.5, according to [Sports Insights](https://www.sportsinsights.com/ncaaf/). 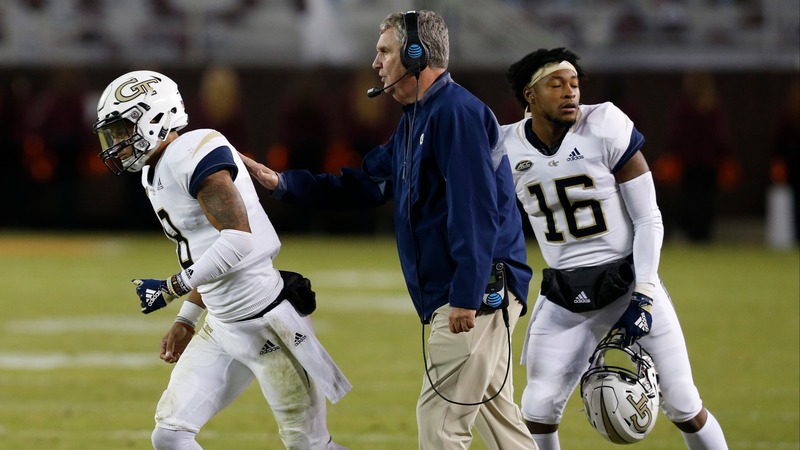 While GT players will likely be motivated to win for Johnson in his final game, current coaches could be distracted after new head coach Geoff Collins decided to [bring his own](https://yellowjackedup.com/2018/12/17/georgia-tech-football-collins-decides-to-start-fresh-with-coaching-staff/) staff to Atlanta. Still, Johnson's final game with the triple-option attack is a favorable matchup against a Minnesota unit that ranks 118th nationally in yards allowed per carry (5.22). Georgia Tech leads the nation with 334.9 rushing yards per game and to make matters worse for Minnesota, leading-tackler LB Blake Cashman will not play as he joins offensive lineman Donnell Greene to prepare for the NFL Draft. It also remains unclear how many Minnesota players and which players from the Gophers’ team will be suspended for a reported violation of team rules. Last Wednesday, coach P.J. Fleck said ([via the Star-Tribune](http://www.startribune.com/p-j-fleck-s-gophers-begin-quick-lane-bowl-prep-in-detroit/503410192/)) “a player or players” would miss the bowl game. If that sounds confusing just wait until you hear how the Gophers are preparing for the triple-option. “We changed our complete defense,” Fleck said. “We have DB’s playing linebacker and D-lineman playing linebackers. Who are the best tacklers and the smartest players that you have? It rearranges positions. You can’t have your normal defenses out there. The whole slogan in the secondary has been ‘boring is good.’ If you are bored, you are doing a great job.” In other two bowl games on Wednesday, sharp money has come in on Cal at pick 'em in the Cheez-it Phoenix Bowl vs. TCU, while money is backing the UNDER and Boston College as an underdog against Boise State in the Dallas Bowl, although S&P+ has a differing stance on the latter game. __MORE:__ ["Public all over Notre Dame" vs. Clemson, oddsmaker says](https://www.betchicago.com/college-football-playoff-odds-betting-lines-notre-dame-clemson) # 2018 college football bowl game odds for Wednesday, Dec. 26 ## First Responder Dallas Bowl betting lines, odds and prediction 12:30 p.m. CT on ESPN ### Boston College vs. Boise State __Point spread:__ Boise State -1.5 __Total:__ 50 __Betting line movement and games notes:__ After a heartbreaking home loss in the Mountain West title game, Boise State opened as a 3-point favorite in Dallas. The total has dropped significantly to 50 with heavy wind expected. Look for both teams to lean heavily on the rush with A.J. Dillion and Alexander Mattison likely getting upwards of 30 carries each. Dillon faces a tougher task against a Boise defense that ranks 21st in opportunity and 27th in stuff rate. __S&P+ prediction:__ Boise State 32, Boston College 23 ## Boston College betting records, stats 2018 SU record: 7-5 2018 ATS record: 7-5 2018 O/U record: 6-6 S&P+ rank: 71 Off. S&P+ rank: 95 Def. S&P+ rank: 28 Special Teams S&P+ rank: 117 __Note:__ S&P+ rankings are an advanced data set of tempo- and opponent-adjusted components of the five factors of college football: Efficiency, explosiveness, field position and finishing drives. Per creator Bill Connelly, a fifth factor, turnovers, is informed marginally by sack rates. __Play and win:__ [Join our free contests](https://betchicago.chalkline.com/) ## Boise State betting records, stats 2018 SU record: 10-3 2018 ATS record: 7-5-1 2018 O/U record: 5-8 S&P+ rank: 29 Off. S&P+ rank: 18 Def. S&P+ rank: 39 Special Teams S&P+ rank: 120 ## Boston College vs. Boise State First Responder Dallas Bowl betting trends Broncos are 7-3 ATS in their last 10 bowl games. UNDER is 5-0 in Broncos' last five games overall and is 11-4 in Eagles' last 15 games following a ATS loss. Boston College is 8-3 ATS as an underdog since last season. Eagles also 11-2-1 ATS last 14 as an underdog away from home. ## Quick Lane Bowl betting lines, odds and prediction 4:15 p.m. CT on ESPN from Ford Field in Detroit ### Minnesota vs. Georgia Tech __Point spread:__ Georgia Tech -6 __Total:__ 56.5 __Betting line movement and games notes:__ Georgia Tech opened as a 4-point favorite and got as high as 6.5 before money came in on the underdog Gophers at the Westgate. Money has also pushed the total down from 61.5 to 56.5. __S&P+ prediction:__ Minnesota 31, Georgia Tech 29 ## Minnesota betting records, stats 2018 SU record: 6-6 2018 ATS record: 7-5 2018 O/U record: 6-6 S&P+ rank: 58 Off. S&P+ rank: 88 Def. S&P+ rank: 44 Special Teams S&P+ rank: 25 ## Georgia Tech betting records, stats 2018 SU record: 7-5 2018 ATS record: 5-7 2018 O/U record: 7-4-1 S&P+ rank: 74 Off. S&P+ rank: 31 Def. S&P+ rank: 105 Special Teams S&P+ rank: 16 ## Minnesota vs. Georgia Tech Quick Lane Bowl betting trends Minnesota is 2-6-1 ATS away from home and is 2-5-1 ATS in its last eight as road underdog under P.J. Fleck. OVER is 6-2 in Georgia Tech's last eight games following a straight up loss. OVER is 5-0-1 in Georgia Tech's last six games as a favorite of 3.5-10.0. ## Cheez-it Phoenix Bowl betting lines, odds and prediction 8 p.m. CT on ESPN from Chase Field in Phoenix ### TCU vs. California __Point spread:__ California -1.5 __Total:__ 38 __Betting line movement and games notes:__ With such a low total in a bowl game, special teams will be key. The advantage goes to Cal, which is 20th overall in S&P+ to TCU’s 121st ranking. These two teams are the bottom-two nationally in red zone points per attempt for those that still like the UNDER at 38. CG Technology books still sit at a pick 'em despite TCU third-string quarterback Grayson Muehlstein making only be his second-career start. __S&P+ prediction:__ TCU 21, California 20 ## TCU betting records, stats 2018 SU record: 6-6 2018 ATS record: 4-8 2018 O/U record: 6-6 S&P+ rank: 57 Off. S&P+ rank: 99 Def. S&P+ rank: 23 Special Teams S&P+ rank: 121 ## California betting records, stats 2018 SU record: 7-5 2018 ATS record: 6-5-1 2018 O/U record: 3-9 S&P+ rank: 64 Off. S&P+ rank: 121 Def. S&P+ rank: 12 Special Teams S&P+ rank: 20 ## TCU vs. California Cheez-it Phoenix Bowl betting trends Horned Frogs are 3-9 ATS in their last 12 games following a ATS win and are 2-7 ATS in their last nine games overall. Frogs also 2-7 ATS last nine bowls. UNDER is 7-1 in Golden Bears' last eight games overall. Golden Bears are 5-1 ATS in their last six games overall.